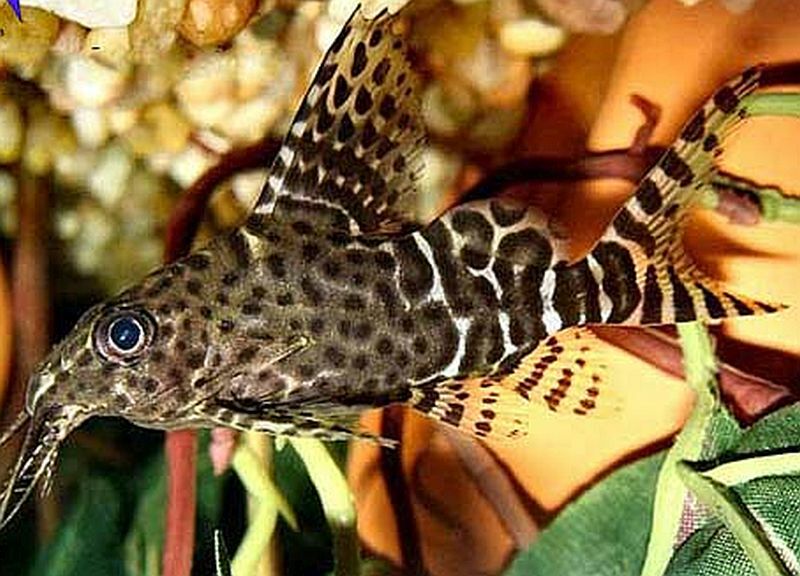 The Featherfin Squeaker (Synodontis eupterus) inhabits much of central Africa, specifically Nigeria, Sudan, Niger, Chad, Ghana, Mali, and Cameroon as well as the White Nile river system. 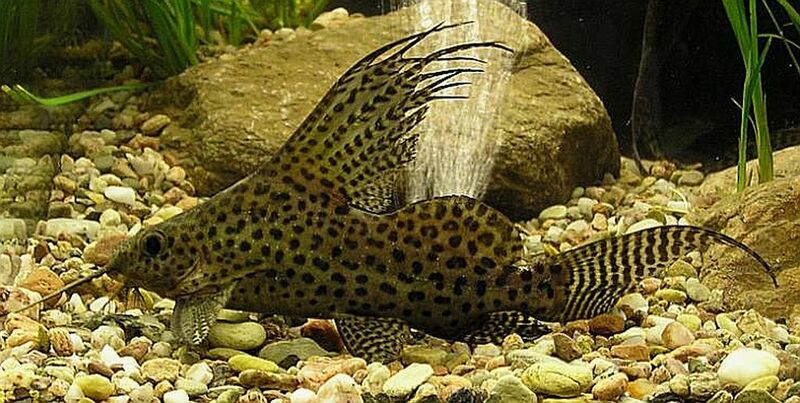 Tropical fish keeping enthusiasts also know the Featherfin Squeaker as the Featherfin Catfish, Featherfin Synodontis, Synodontis Lace Catfish, and Lace Cat. Featherfin Squeakers are a species of “upside down” catfish that can swim upside down at will. The name squeaker originates from the sounds they emit during spawning to ward off competitors and predators. Featherfin Squeakers have a flattened underside and triangular flanks which lead up to their sharp, spined dorsal fin that in adults develops huge lacy, feathery, extensions for which they are noted. They have pronounced flexible barbels that they use to seek out food and ward off competitors. Their bodies are usually spotted or patterned with brown, black, and sometimes a dark gray. Because Featherfin Squeakers can range greatly in color, they are frequently confused with similar Synodontis species and are often sold as a completely different species by inexperienced tropical fish keeping enthusiasts. Juvenile Featherfin Squeakers look completely different from adults. Juveniles usually lack the distinctive dorsal fin extensions and are often misidentified with Synodontis nigriventris, another upside down catfish species. As they mature past 4 inches in length, their distinctive long flowing fins and delicately spotted body makes identification clear. Females are usually larger than the males, have a larger girth, and often develop pot bellies. In their natural habitat, Featherfin Squeakers live in small groups near the bottom of moderately fast flowing muddy or rocky bottomed rivers where they prey on insect larvae and vegetable matter. In an aquarium environment they make a great bottom scavenger that can be kept alone, with others of their own kind, or in a peaceful community tank setting. When kept with other Squeakers, they should be provided with a tank large enough to give each individual a particular spot under a piece of driftwood or in a hole to call their own. Featherfin Squeakers are best housed in a dimly lit aquarium of at least 55 gallons with a fine gravel or sand substrate mix, plenty of rocks and driftwood they can use as hiding places, some plants for refuge, and plenty of swimming space. They enjoy each others company and when kept with others of their own kind in a well decorated aquarium, will actively “frolic” with each other around the tank. Featherfins thrive in well established aquariums and will immediately stake out a hole in a piece of driftwood or a crevasse to call their home when introduced. 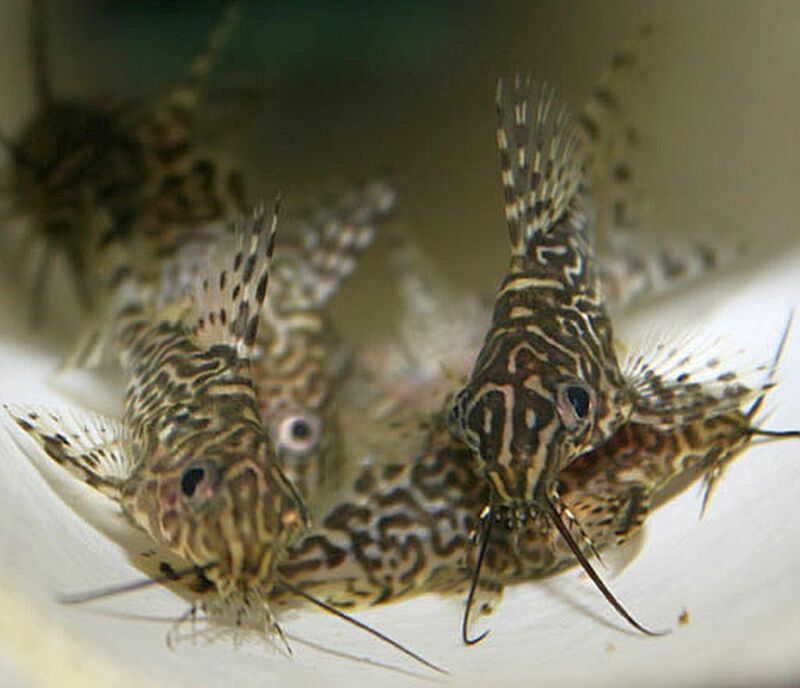 Although Featherfin Synodontis are commercially bred in fish farms with the aid of hormones, to date they have not been successfully bred in an aquarium environment. In their natural habitat, Featherfin Squeakers are nocturnal omnivores that feed on insect larvae, algae, and any other foods they can scavenge. In an aquarium they are enthusiastic eaters and will consume nearly any food they can locate on the bottom of the tank. Meaty foods, tubifex , mysis shrimp , small earthworms, brine shrimp , sinking omnivore tablets, and almost anything else will all be eagerly accepted. The Featherfin Squeaker can usually be ordered from tropical fish shops or online and are moderately priced. They are usually sold as juveniles at 1 1/2″ to 2″ in size.